– New York requires 6 months of Zamboni Ed classes. – Key Bank Arena’s ban on texting while ice resurfacing. – Now that two Zambonis are used, must carry uninsured Zamboni insurance. – Zamboni radio can’t pick up NPR. – Rob Ray refuses to apologize for keying Zamboni’s hood. 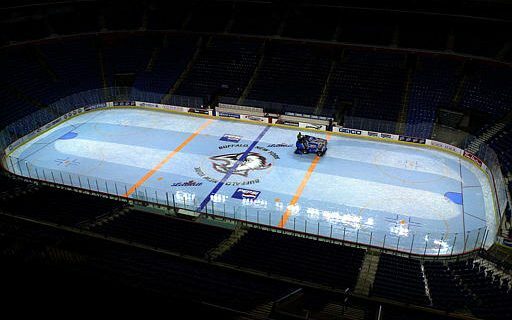 – Zamboni license immediately revoked if caught exceeding Key Bank Arena’s maximum speed limit of 2 mph. – Doug Allen keeps begging to ride shotgun. – Must bring your own Zamboni to DMV road test. – Still need cataract surgery from the blue ice experiment. – Zamboni valet parking attendant always reeks of whiskey. – Running over Sabretooth carries 4 points on license. – When reporting engine troubles to a mechanic, management mandates we say nothing more than describing it as a lower engine injury.